Originally from the Midwest, Ralphie Hardesty lives in Austin, TX. 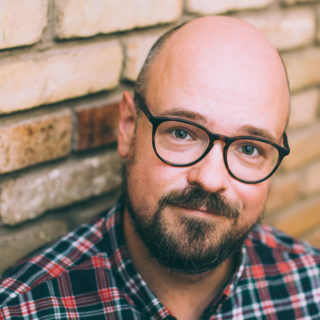 Hardesty has been producing and hosting comedy and variety shows in Austin for years, including the long-running queer storytelling show, Greetings from Queer Mountain, which has been educating and weirding out unsuspecting cisgender heterosexual Texans at Cheer Up Charlie’s for 71 consecutive months. Ralphie has appeared on many festivals around the country, including previous Moontowers, Bridgetowns, and many others. He has appeared on PBS and Ovation (which is a TV station, or was once, I swear), and you can regularly see him on 6th St. as a cast member of the Austin comedy staple, Master Pancake Theater. His dogs are extremely cute and heavily featured on his Instagram: @ralphiehardesty.